When ceiling mounted microphones first hit the scene, they were popular from the concealment standpoint, but the sound capture quality left much to be desired. With Shure’s latest MXA910, the sound capture quality is along the same lines as table-mounted microphones. The MXA910 is also coupled with Shure’s IntelliMix® DSP Suite, which compliments the microphone array quite well. 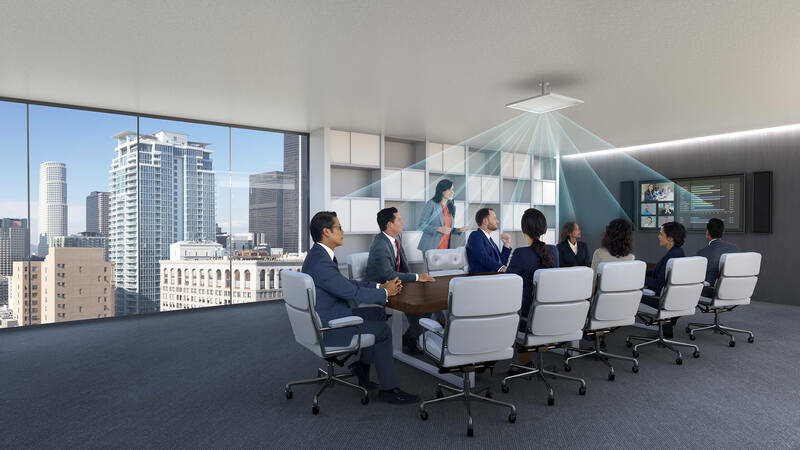 Steerable Coverage™, part of the IntelliMix® DSP Suite, is a great piece of technology that allows for complete digital customization of the rooms audio capture coverage. What is even better about Steerable Coverage™ is the fact that the beams can be programmed under different setting modes that can be easily selected with the press of a button on the rooms programmed control system, such as a Crestron or AMX system. All the end user needs to do upon entering the room and powering the system on is select whatever configuration that has been programmed that meets the needs of the room for the day. The MXA910 can be mounted flush with the ceiling tiles, as the array itself appears very similar to a ceiling vent for a HVAC system. In this form factor, the array is only noticeable to a trained eye If desired, the array can also be mounted in a hanging fashion, similar to a pendant speaker. The MXA910 is available in 3 different colors as well. Black, White, and Aluminum are the color choices, with white being the most popular due to the similar color as ceiling tiles and vents. If you are interested in learning more about the Shure MXA910 Ceiling Microphone Array, please give us a call at (714) 637 – 7272. We are more than happy to assist!